The QuickTime MOV movies are typically found online. If you are wondering how to convert MOV to VOB, you need to employ a suitable video converting program so that you can watch the QuickTime movies using your DVD player. Aimersoft Video Converter Ultimate is such an ideal tool that is specifically designed for the conversion from MOV format to VOB. This MOV to VOB converter is suitable for the conversion from high definition files to other formats in superior quality. In addition, using this converter is quick and easy as well as supporting all of the most recent standards and technologies. 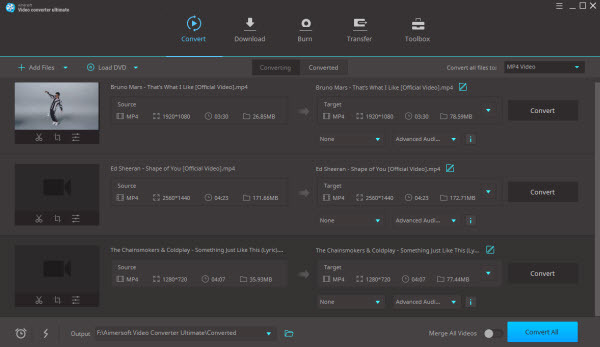 Aimersoft Video Converter Ultimate enables you to pull out the audio from any video and save them in the format of MOV. What’s more, it can even optimize the video files to make it compatible with other portable devices such as the iPod, iPad and Android devices. If you want, you can work on editing your MOV videos. You have the option to adjust the effects, crop, trim, rotate, add watermarks and many more since different functions can be used depending on your preferences. Mac users who want to convert the MOV files to VOB can turn to Aimersoft Video Converter for Mac. Initially, you have to make sure that you have downloaded the compatible version. Once you have finished downloading, it is time to install and launch the MOV to VOB converter. Click the Add Files button to import the MOV movies or you can drag them from your hard drive to the program. This software supports batch conversion, so you can add multiple files at a time. Select VOB as the output format. You can also edit the video file as you like. Right-click to a certain video file and open the video editing window. For better visual effects, you can change the visual effects, crop the frame size, trim the play time, add watermark and subtitle. You can view the edited video on the preview window. Click on the big button Convert to start the conversion. Once the conversion process is completed, you can now play the MOV videos on your home DVD player without any hassle anymore. Now that you are familiar with the steps on how to convert MOV to VOB format, you can easily convert any MOV files that you have in a fast and easy manner. My Macbook Pro has a crazy amount of MOV files I downloaded in college, and now that I have a career and a place of my own I would really like to watch those on a DVD player rather than on my laptop. After searching around the internet for a program to convert MOV to VOB, I finally found Aimersoft and couldn't be happier with my purchase. You guys absolutely rock!